What better way to keep kids busy during school break than with lots of fun, easy, holiday-themed DIYs? This winter, bring your family together around the craft table to create handmade Christmas tree ornaments, holiday decorations, and personalized gifts. Try these projects (especially chosen for youngsters) this year for a homemade spin on Christmas. So don’t wait, mix up a big batch of hot cocoa and call the kids—it’s time to craft! Given up on finding mates for a couple of odd socks hanging out in the laundry room? 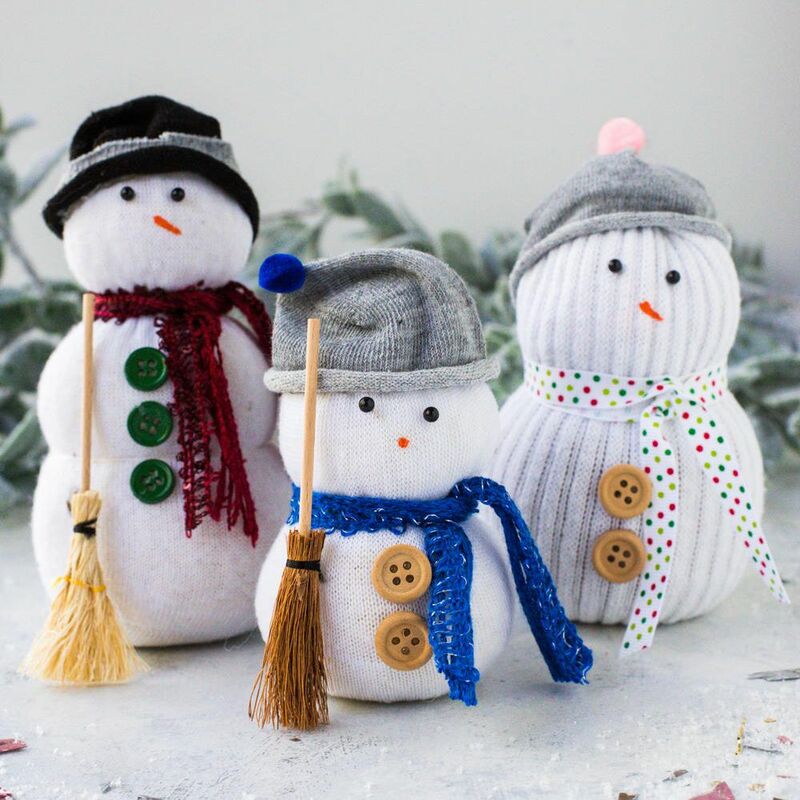 Put them to work as wintry snowmen with this easy tutorial. Little ones will love meticulously filling their sock with uncooked rice, rubber-banding it into a snowman, and decorating with buttons and paint. An adult can help by sewing (or gluing) everything securely shut. Head out to the yard to gather supplies for this tried-and-true Christmas craft. A clean pine cone works great as a rustic base for glue and glitter. Set kids to work glittering in a shallow plastic container to simply cleanup later. Wire ornament hooks attach pretty easily to one of the upper pine cone scales, but a partially unbent paper clip or bit of yarn would work in a pinch too. Capture a moment in time by printing your toddler’s palm into a mound of homemade salt dough. This project is perfect for the littlest crafters—they can help with everything from mixing up the dough, pushing their hands in, and painting the piece once it’s dried overnight. Tie a piece of string through to turn these into ornaments, and add them to the tree or wrap them for the perfectly DIYed grandparents’ gift. While your little one may need your help building a load-bearing structure out of baked goods, they’ll certainly enjoy decorating these traditional holiday houses. Provide plenty of frosting and colorful candies, and let kiddos get messy with this one. Royal icing works best as an adherent—it’s super sticky and dries quickly. Graham crackers are an easy, non-homemade building block for “gingerbread” houses. No baking required! For this tactile craft, triangles of aluminum foil are the only sculpting material necessary. Children can practice motor skills by squeezing the foil to form spindly icicles, and can then indulge their whimsical sides by adding glue and glitter. These look great as sparkly Christmas tree ornaments or strung together in a handmade garland. Turn empty yogurt cups into an art supply with this adorable reindeer DIY. Kids can paint the clean, empty, yogurt cup Rudolph-brown, then glue on a set of eyes and a glowing red nose. Metallic pipe cleaners work well for Rudy’s antlers, and a few of these recycled reindeer clustered together make an especially lovely centerpiece. Pre-cut tissue paper circles in various colors to make this easy art project even simpler. A paper plate—the ubiquitous kids’ craft base—works wonders again as a plain bobble ornament, ready to decorate. A little white school glue adheres the tissue paper easily, then finish the craft with a black construction paper square and bit of ribbon to create the ornament’s hook. If you start with colored craft sticks, this quick project doesn’t require any messy paint or markers. 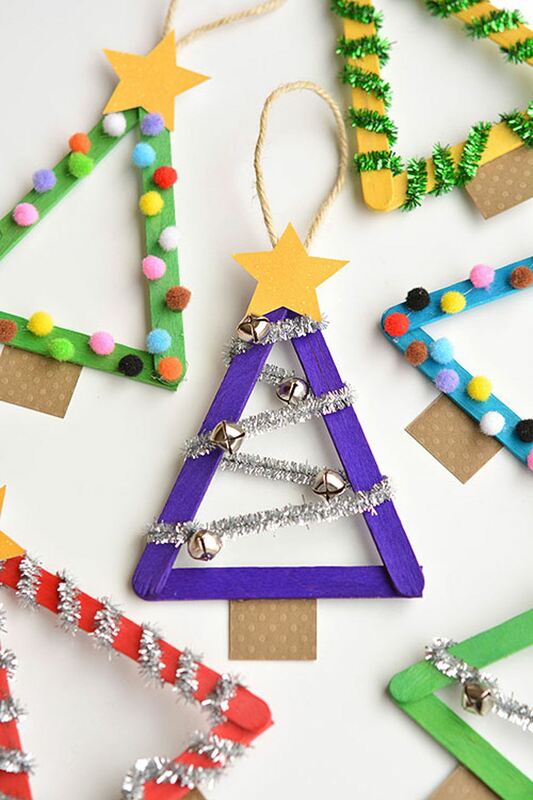 Parents should hot glue Christmas tree triangles together, and kids can add flair with glitter, pom poms, and mini jingle bells. Make a whole set to display as homemade decor; these popsicle stick Christmas trees look darling strung together in a homemade garland. Another great option for a low-cost craft, these candy cane reindeer will add a touch of kitsch to your Christmas decor. Simply glue on teeny red pom pom noses and googly eyes, then twist a length of brown pipe cleaner antlers around the candy cane curve. If you’d prefer to keep your candy canes totally edible, swap out the craft glue for royal icing. Take a break from Elf on a Shelf and instead challenge kids to create one of Santa’s helpers on their own. A paper plate works perfectly as an Elf’s face, then construction paper shapes become his hat and coat. Add pom pom accessories and a pair of googly eyes to finish this fun, preschooler-friendly decoration. Use this straightforward gingerbread cookie recipe to get your holiday baking started. Little ones can definitely help mix ingredients, roll out dough, and use cookie cutters to create fun shapes (think: gingerbread men, stars, and Christmas trees as well). After these cookies have cooled, break out the colorful icing and sprinkles for an afternoon of edible crafting. Gather up your toiletries for this cute kids’ craft, and put the cotton balls to work. Adults should glue a simple popsicle stick triangle together, then kids can paint it red and add a construction paper backing. Finish with a cotton ball trim and a poofy pom pom, and these adorable Santa hats work great as DIYed place cards for your holiday meal. Popsicle Stick Santa Hat from Hunny, I’m Home! When little ones can spend a crafty afternoon creating their own playthings, that’s a parent win-win. Use a brown paper bag as the base for this hand puppet, then add eyes and a red nose face. Trace kids’ hands onto construction paper, then cut and paste onto the bag for antlers. This project is so simple, kids will want to create a whole team of reindeer to play with. Especially great for toddlers with sensory sensitivity, this easy project doubles as a tactile activity. Glue construction paper snowman features to the front of a locked sandwich bag, then fill with shaving cream (or try white glue, or homemade slime). Add a strip of hot glue to seal the baggie permanently to avoid accidental spills during playtime. Trim the center circle from a paper plate and your kids have an easy template for a Christmas wreath. They can paint it, cover with tissue paper, or decorate with felt squares. Traced and cut hand prints work well as a festive bow, then hang your wreath on the front door for a DIYed holiday welcome. A twirled, swirly marker line acts as the cord for a string of painted Christmas lights in this festive artwork. Little ones press colorful fingerprints and thumbprints sporadically along the wire, and can finish with a written holiday message. Details like a shiny white glint on each bulb (puffy paint or glitter glue are perfect) bring this piece to the next level. This handmade artwork makes a great personalized Christmas card or gift tag. Embrace getting a bit messy with this craft! Press a bunch of kid-sized footprints onto plain paper, let dry, and add reindeer features. Opt to draw a pair of eyes, antlers, and a red nose, or use plastic wandering eyes and fuzzy pom poms for a three dimensional effect. Cotton swabs bring the magic of a holiday snowstorm indoors with this festive snowflake artwork. Adults should trim a handful of cotton swabs at various lengths, then preschoolers can work on puzzle solving and symmetry skills by arranging snowflakes. Regular school glue adheres cotton swabs to card stock, then these are ready to hand around the room.